The link will open a copy of the paper if you have a subscription to the journal. 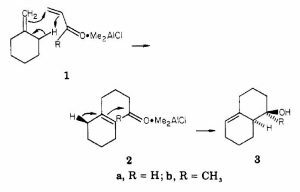 The synthesis of the hexahydronaphthalene moiety of (+)-mevinolin has been achieved in 10 steps using an intramolecular Diels-Alder reaction of an alkenylallene to set up four of the chiral centers and the diene unit of mevinolin. 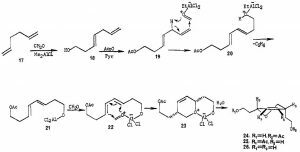 A formal total synthesis of pseudomonic acid A has been achieved by using an ene reaction in sequence with a quasi-intramolecular Lewis acid catalyzed Diels-Alder reaction, which converts 19 to 24, as the key step. 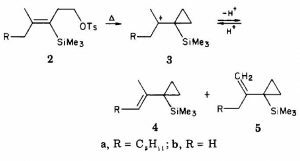 “Quasi-intramolecular” refers to a Diels-Alder reaction in which the Lewis acid binds covalently to the diene and complexes to the dienophile, providing the regiochemical control typical of intramolecular Diels-Alder reactions and the acceleration typical of Lewis acid catalysis. 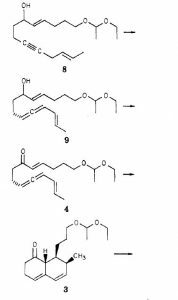 The scope and mechanism of this reaction are explored as well as its potential for control of endo-exo stereochemistry and stereochemistry on a side chain. 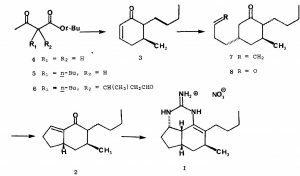 A seven step synthesis of ptilocaulin via the addition of guanidine to enone 2 is described. Reaction of formaldehyde and trimethylaluminum with an enol ether derived from an aldehyde gives the adduct resulting from addition of hydroxymethyl and methyl groups to the enol ether double bond. The threo isomer is formed selectively (90-95%) from either isomer of the starting enol ether. 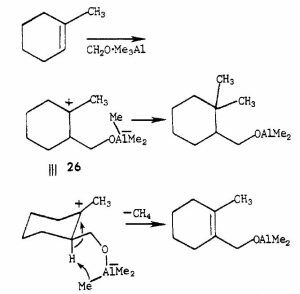 The mechanism of this reaction is discussed. Reaction of formaldehyde and trimethylaluminum with an enol ether derived from a ketone gives the ene adduct, which should allow selective sequential reaction at the α and α‘ positions of ketones. 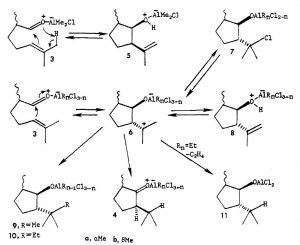 Alkylidenecycloalkanes 1 undergo two sequential Me2Cl-catalyzed ene reactions with a,b-unsaturated carbonyl compounds to give bicyclic alcohols 3. At low temperatures, the initial ene adducts 2 can be isolated when vinyl ketones are used. This reaction has been used for the synthesis of 24-oxocholesterol. Other classes of alkenes give more complex mixtures. 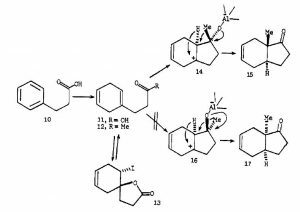 The scope, limitations, and mechanism of this reaction are discussed. MeAlCl2-initiated cyclization of dienone 12 provides the functionalized trans-fused hydrindenone 15 in 50% yield. 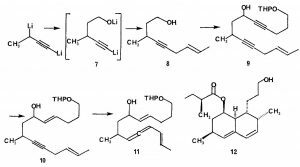 Ketone 15, which is now readily available in three steps from hydrocinnamic acid via this novel cyclopentanone synthesis, has been used to complete a formal total synthesis of 11-oxo steroids. Ethylaluminum dichloride, which is a strong Lewis acid and a proton scavenger, catalyzes the ene reactions of aliphatic aldehydes with nonnucleophilic alkenes. Higher aldehydes give good yields of ene adducts with terminal alkenes. Formaldehyde gives good yields of adducts with electron-deficient alkenes. This reaction has been used for the synthesis of recifeiolide, ricinelaidic acid, and the insect pheromones (E,E)-8,10-dodecadienyl acetate and (E)-9,11-dodecadienyl acetate. 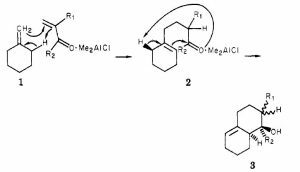 EtAlCl2 catalyzes the ene reactions of a-substituted acrylate esters with trans 1,2-di- and trisubstituted alkenes. 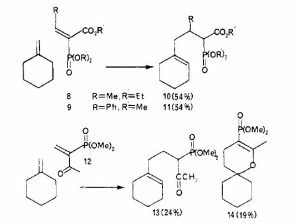 The reactions are regio- and stereoselective. The ester group adds endo and a hydrogen is transferred selectively from the alkyl group syn to the vinylic hydrogen. 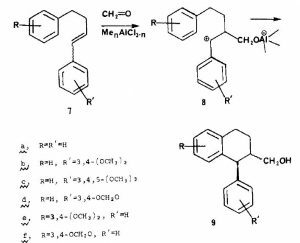 Methyl a-chloroacrylate, a-bromoacrylate, acetamidoacrylate, and methacrylate, ethyl a-bromomethylacrylate, and dimethyl itaconate were explored. 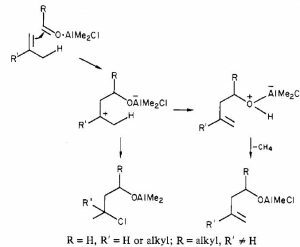 Dimethylaluminum chloride, which is a mild Lewis acid and a proton scavenger, catalyzes the ene reactions of aliphatic and aromatic aldehydes with alkenes containing a disubstituted vinylic carbon. Proton-initiated rearrangements do not occur, since the alcohol-Lewis acid complex formed in the ene reaction reacts rapidly to give methane and a nonacidic aluminum alkoxide. 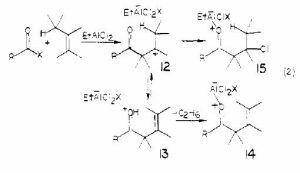 Formaldehyde and excess Me­2AlCl give good yields of ene adducts with all types of alkenes. With 1 equiv of Me2AICl, formaldehyde and mono- and 1,2-disubstituted alkenes give γ-chloro alcohols resulting from cis addition of chlorine and hydroxymethyl groups to the double bond.